There are a lot of games in the iTunes library and some of the most common types are all about building money or energy over time. The problem with these games is not that they are not fun, but that so many of them are similar. Building a farm or a city may look different but if the mechanics are identical it hardly matters. The same is true of fighting dragons or running a mafia syndicate. Tiny Tower is a game that uses that money over time idea but manages to do something different with it. 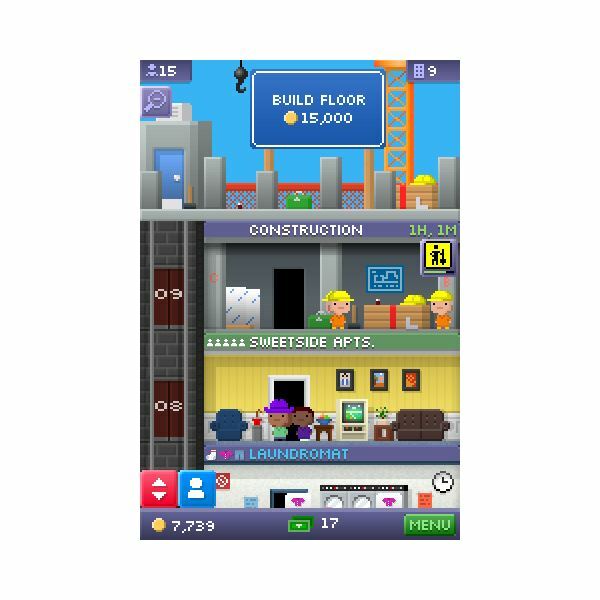 Tiny Tower allows you to create a tower with a variety of different businesses and potential employees with the aim of finding the best possible way to earn money so that you can expand. Not entirely original, but different enough that it really does feel like you’re playing something new and fresh. The actual gameplay mechanics of this title are very simple. You are building a tower. Each level of that tower will have either a business or residential area. The residential areas can have up to five people, while each business is able to employ as many as three people. Each of those people has five different abilities. These abilities are food, service, recreational, retail and creative. These represent how well they will do in each of the different types of business. In addition each of them has a dream job. Find them this job and you will get a bonus to the ability to stock that business, as well as sometimes getting Tower Bux. Tower Bux are the secondary currency. Like nearly every game of this type you have the option of buying these, but unlike most you can earn them at a reasonable rate without spending any money. They can be used to speed up the stocking of products, the sale of those products, building floors or they can be sold for more normal money. You can earn these in a variety of ways including helping people find their dream floors, giving people rides on the elevators or helping to find people in the building. So while there are never quite enough of these to do everything you want, if you spend time playing the game you’ll generally have a few all the time and can save up for what you need without spending money. The graphics are not as smooth as many games in the iTunes library. Instead it goes for a more retro 8 bit look. Yet, even though it uses large pixels, it is able to create a lot of detail which is in some ways easier to see on the small screen because of the style that it uses. This also simply makes this game feel more like the games of an early time and the nostalgia factor combined with a good game is excellent. The music also attempts to capture that feel, but it does not do it as well. The sound effects are very limited and the music doesn’t really add anything to the game. It is generally pleasant enough though and so it doesn't take anything away either. The basic interface of the game is very simple. You only have one option to build at any time and that is at the top of the tower. Beyond that you can touch any floor to see what is stocked and what needs to be stocked and to find information on its employees. The same is true of the residential areas, except it shows information only on the people. Finally, the elevator is what you will use the most. Simply touch it when there is someone waiting to use it and you’ll get an up and down button. There is other information that you can glean from looking across this, but none of it is anything you need to know at the beginning. A bit more complex is the menu interface. Click on that and you’ll be taken to a screen with a number of choices. This will give you a variety of options. 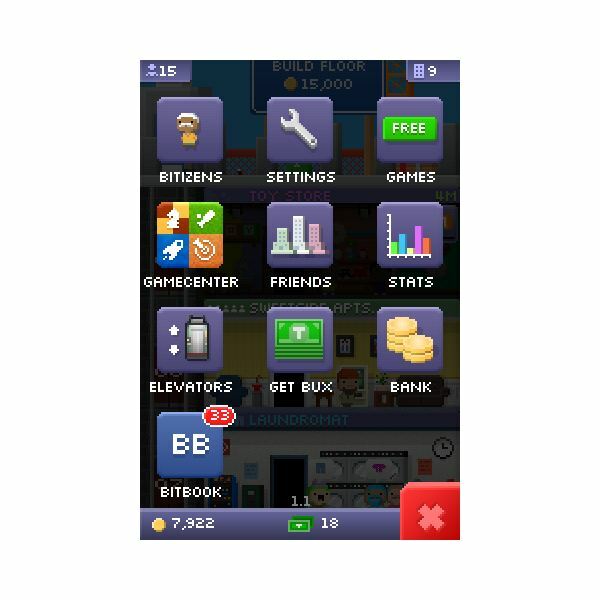 You can find other games, buy Bux, look at everyone in your tower and perhaps most interesting of all is the bitbook. This is a sort of forum in which the people who live in your building communicate. The strategy of Tiny Tower is generally very simple, but there are a few things that can add a lot of value. The biggest of these is finding people their dream jobs. If you give someone their dream job they will be able to stock twice as much. This means that you can sell twice as much before having to come back and make more money in the process. It is also important to try to keep one spot open on each floor unless you have everyone in great jobs. The reason for this is that as your tower goes up getting new people to move up can be difficult and having them go to a floor with no room for new people is a waste. Another major point you’re going to want to consider is saving up your Bux. You can use them to speed up things throughout the game but the best use of these is the elevator because you have to be playing to use that. You’ll need 25 for the first and once you reach the tenth floor it will be worth the effort. So, while it is tempting to use the Bux to speed up the stocking so you can earn money, it generally isn't the best choice. Finally, you'll want to use VIPs effectively. To do this you need to understand that once you choose to use the VIP you'll be unable to do anything else until you move him. They generally either encourage people to go to a specific floor, buy things from a specific business, help stocking or help construction. This means that if you have any of these that you can begin before you use the VIP you should. For example starting the construction of a new floor is something you should do before using a VIP if possible. Tiny Tower is not the fastest of games in the iTunes library. It can take hours or even days to add even a single floor to your building. Yet there is almost always something that you can do. In addition there have been a few minor features added to help keep the game interesting and addictive. So if you like games that you can check into for a few minutes every few hours to play then Tiny Tower has the potential to become one of your favorites, but if you prefer quick action games it likely isn't going to be what you're looking for.